When I first saw the extra set of jaws inside the already terrifying jaws of the aliens in Aliens, I think I might have laughed a little. I mean, come on. 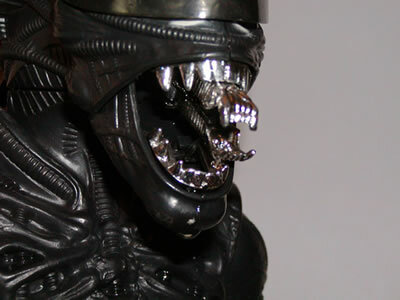 It's kind of ridiculous to think that an animal - or alien being - would actually need an extra pair of jaws. Movie hyperbole, obviously. Moray eels, it turns out, also have an additional set of jaws that sneak up and grab prey and drag it directly to the eel's stomach. 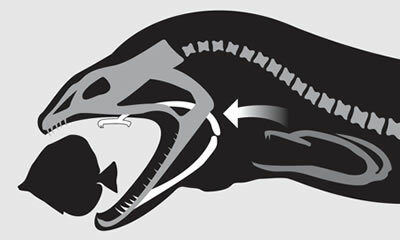 It took high speed photography to capture the pharyngeal jaws, located in the back of the eel's throat. These natural forceps dart forward faster than a blink to seize the flesh of their prey. Even researchers were struck by the similarity to the movie. Via LiveScience. Thanks to Vik and BajaB for the tip on the story.